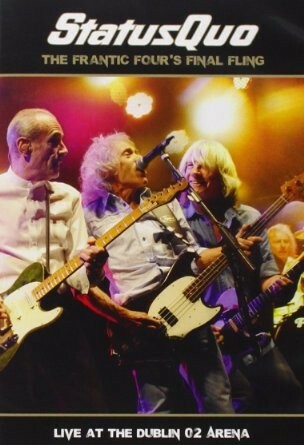 When Status Quo put the original line-up back on tour in 2013, the demand for tickets was so incredible that a further round of dates was pencilled in for 2014. This show was recorded at the Dublin 02, dubbed 'The Frantic Four's Final Fling', and it intended to be released on DVD, Blu-ray, 2CD and of course, wonderful double vinyl. Having attended two dates (one from each tour), I can attest to this DVD capturing all the sweat and excitement of these unforgettable shows. The familiar taped intro from Jackie Lynton begins proceedings, while the four guys strike the pose from the 'Hello' album, before taking their positions. These days, bass player Alan Lancaster's health means he is pretty stationary for most of the show. Looking greyer these days but still sounding on top form vocally, the familiar intro to 'Junior's Wailing' begins, one of three songs Lancaster sings in the set. Both Rick Parfitt and Francis Rossi seem to enjoy their freedom away from the mic stand, both jumping around and exchanging smiles and in ear chatter. Sound wise, the band have managed to capture lightning in a bottle twice, close your eyes and it could still be 1976! John Coghlan's percussion is precise and a joy to watch during 'Railroad' while Parfitt's rhythm guitar work on 'Big Fat Mama' has the man playing like his life depends on it. The inclusion this tour of 'Caroline', 'Down Down' and '(April) Spring Summer And Wednesdays' are played to perfection; let's face it Rossi and Parfitt could play these songs in their sleep! The whole band really seem to be having a great time together, and it comes across in the fantastic atmosphere, with both the fans and band, aware this was Rock 'n' Roll history in the making.